Delaware Mayor Carolyn Kay Riggle said she thought the American flags downtown looked worn and dirty, and decided to do something about it. Riggle approached Ron Falvo at JR Cleaners about the cost of cleaning all the flags but Falvo offered to clean them for free. 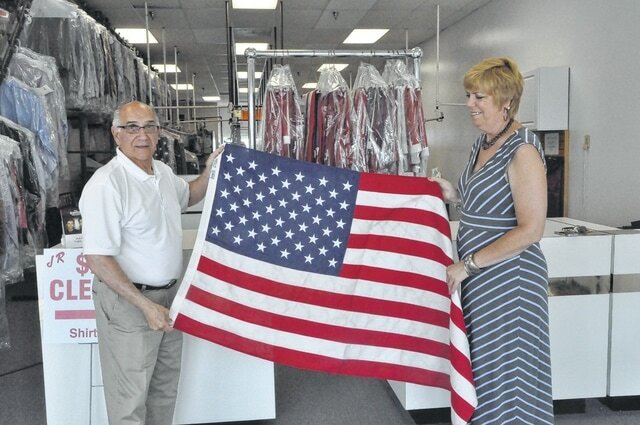 Above, Riggle and Falvo hold up a freshly cleaned flag at JR Cleaners Wednesday morning. Riggle said she wanted to have the flags cleaned and put back up before Flag Day this Sunday.